RoadToParnassus: How Many Brass Mouthpieces Do You Need? How Many Brass Mouthpieces Do You Need? Of course, there is no limit to the number of mouthpieces I need, but what struck me about her question was that although they may appear similar, there are worlds of differences between mouthpieces that make ownership of many of them not an idle whim, but a vital necessity. Unpacking these brass mouthpieces was like visiting old friends. I like to play old brass instruments, especially the cornet and the alto horn, and each mouthpiece has its own qualities and merits. The difference they can make in the playability and sound of each instrument is almost unbelievable. This is in addition to their different appearances and historical associations. 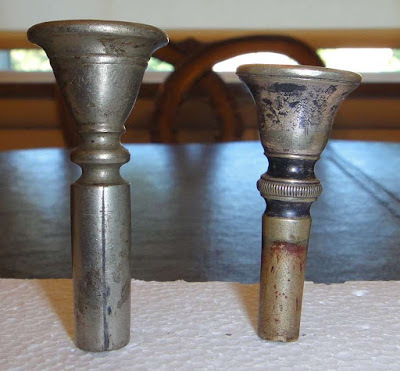 The mouthpieces they make today can be very high quality, but they are very inappropriate to use with old instruments. This is especially true for cornet mouthpieces, which used to be conical in shape, and gave a more mellow sound. 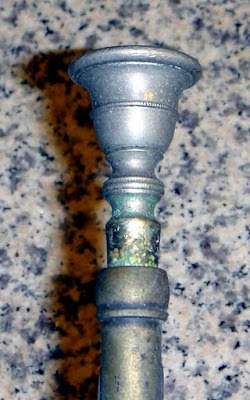 Today’s cornet mouthpieces are really miniature trumpet mouthpieces, featuring a cup-shaped interior, and give even antique cornets a more brilliant, trumpet-like sound, which is at odds with old cornet music, which, while capable of brilliance, revels in its moonbeams-and-roses, Victorian atmosphere. The late 19th and early 20th century were the golden era of brass instruments, when every town had its own brass band, and cornet and trombone soloists such as Jules Levy, Herbert L. Clarke, and Arthur Pryor were all household names. 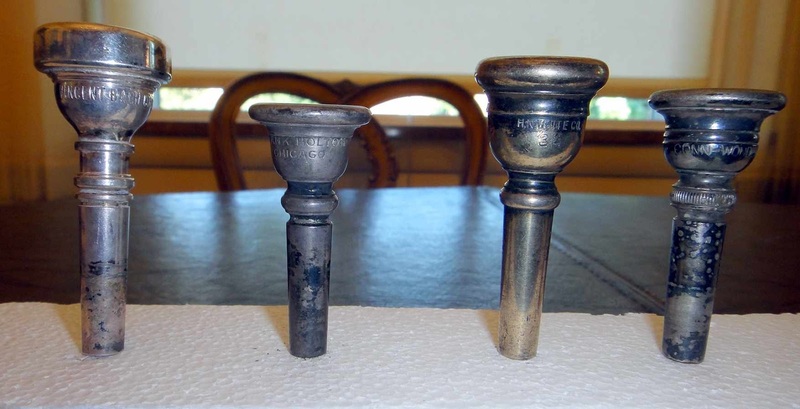 Many old mouthpieces feature the names of premium manufacturers, and were modeled after the preferences of the famous brass soloists of years gone by. This tuba mouthpiece is very special to me, as it belonged to my grandfather, a professional tuba player and music store owner in Canton, Ohio. It was custom made to his specifications by the famous maker Vincent Bach, and has my grandfather’s initials, E.G. for Edward Gottlieb, stamped on it. 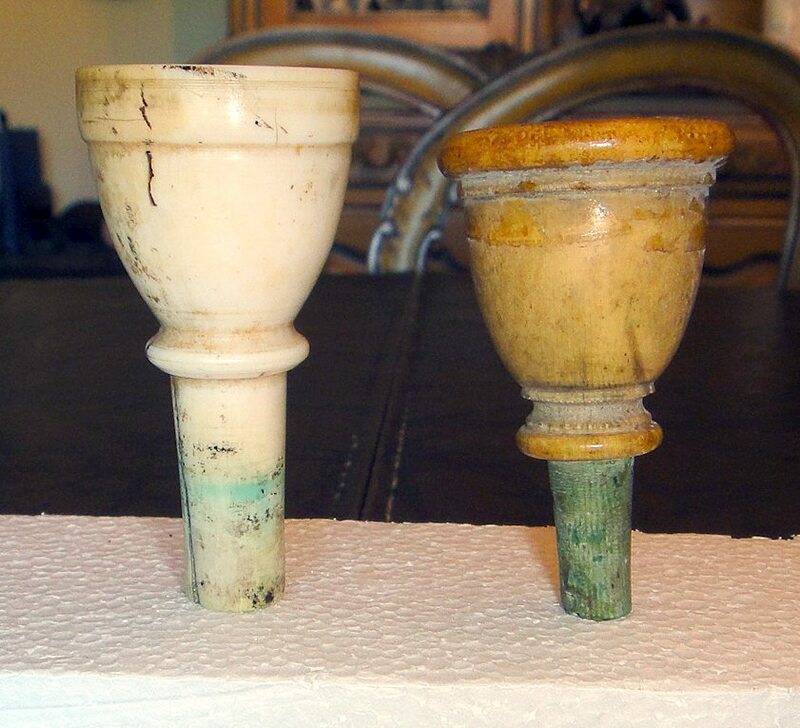 Here are two very early ivory mouthpieces made for bass instruments such as serpents and ophicleides. An example in the V&A of a serpent, an early bass instrument and predecessor of the ophicleide and tuba, and often played with ivory mouthpieces like the above. Three trombone mouthpieces from different eras. At left is a modern Vincent Bach, in the middle an anonymous Victorian example, and on the right an early 20th century Lyon and Healy, a fine maker, with its more sleek “moderne” shape. Two trombone mouthpieces endorsed by famous players. At left is a Conn Pryor model. Arthur Pryor was possibly the greatest trombone player in history. On the right is an Innes model, also by Conn, named for Frederick Neil Innes. 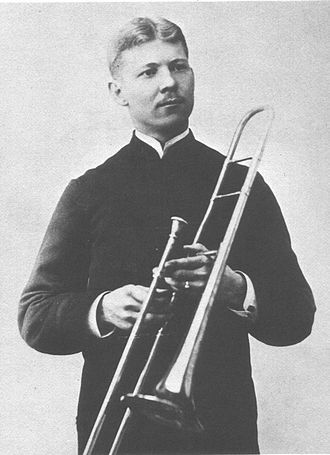 Arthur Pryor was a trombone player whose virtuosity was stunning, and whose playing was often captured on early records. He also wrote many of the more difficult trombone solos still played today. Frederick Neil Innes was another trombone soloist of the golden era, who likewise wrote solo compositions still popular with all brass players. 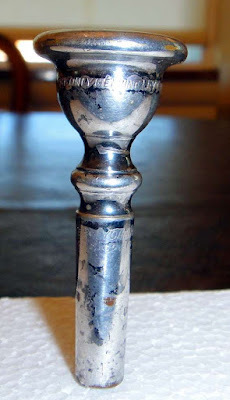 A modern but fine quality French horn mouthpiece by Rudy Muck, which I found at a house sale just last summer. 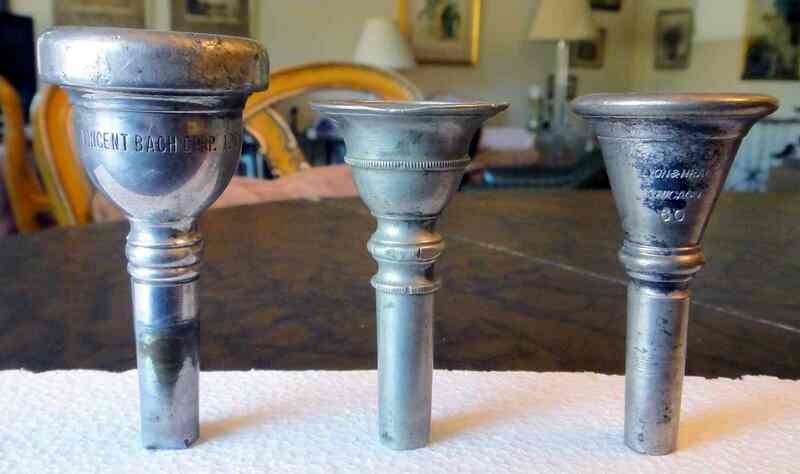 Three early trumpet mouthpieces, by Hill, anonymous, and Cousenon, the latter a fine French maker. 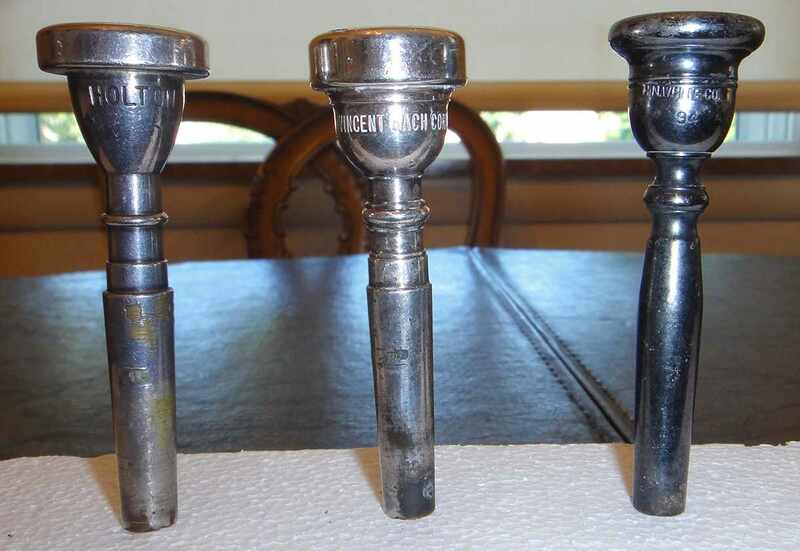 More modern trumpet mouthpieces by Holton (always a great name), Vincent Bach (again), and H.N. White, a maker of professional quality instruments in Cleveland, Ohio. Finally, we get to the all-important category of cornet and bugle mouthpieces. Here are two very early examples. 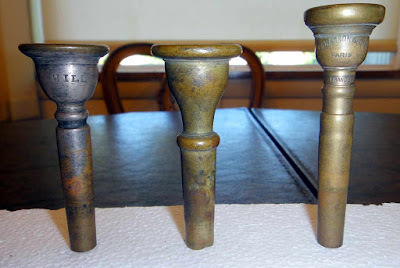 Classic early cornet mouthpieces by Pepper, Besson (another important French maker), McMillin (another quality Cleveland maker), and Charles Triebert. Charles was the brother of Frederic Triebert, the maker most important in developing the modern oboe (my main instrument). The Charles Triebert company continued into the 20th century, and appears to be a mass maker of many types of band instruments. A variety of good cornet mouthpieces. First, a modern Vincent Bach (naturally! ), followed by a fine and classic Frank Holton. Next is a H.N. 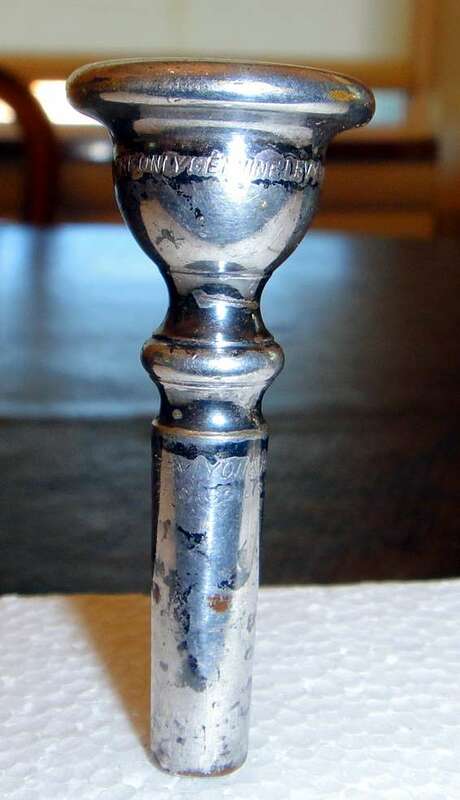 White cornet mouthpiece (White was McMillin’s foreman, and apparently took over his operations.) Finally, a Conn Wonder, an instrument and mouthpiece that seems to find special favor with musicians. 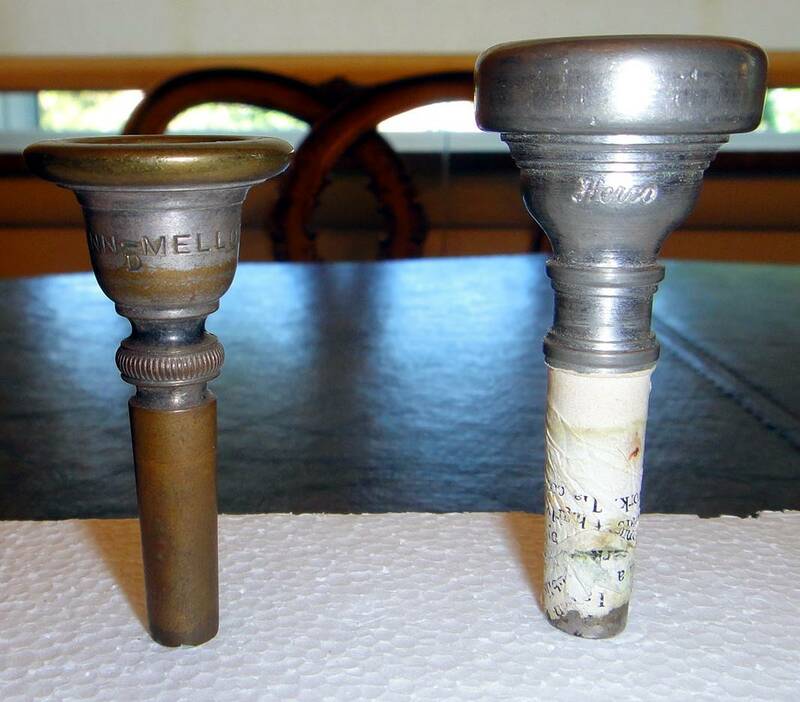 A top view shows the differences between old and newer cornet mouthpieces. Notice the shallow, cup-like depression in the Bach mouthpiece on the left, in addition to its general massiveness, compared to the deep, conical interior of the older and lighter Holton model on the right. The shape of the interior is probably the single-most important factor in the basic sound of the instrument. A spectacular find, “The only genuine Levy Model” made by Lyon and Healy. 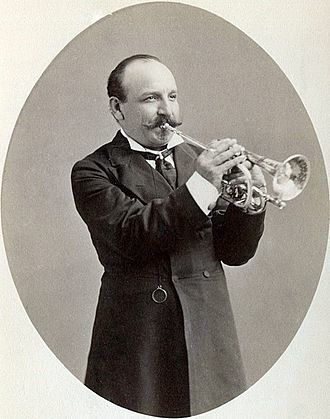 Jules Levy was the greatest cornetist of the late 19th century. Jules Levy was habitually known as “The World’s Greatest Cornetist.” Although he did make a few fine records in the early 1900’s, he was by then a little past his prime, but these records are still treasured. In addition to his brilliant playing, he was known for his beautiful phrasing, and famous opera singers would attend his concerts to hear him play and learn from him. Along with the mouthpieces themselves, one has to look out for the small tuning bits or shanks, which could correct the pitch of an instrument in an era of multiple pitch standards, or even make it play in another key, while acting as a liaison between mouthpiece and instrument. A special tribute to my very favorite: an anonymous 19th century alto horn mouthpiece. It might not look like much, but it plays great, and is very comfortable. I brought this to Taiwan to play with an old Conn alto horn from the 1920’s, but unfortunately brass instruments are too penetrating to play in an apartment (I don’t hate my neighbors that much!). At this point, the different silhouettes of the mouthpieces will convey more meaning, as well as show the size range for the several types of instruments. 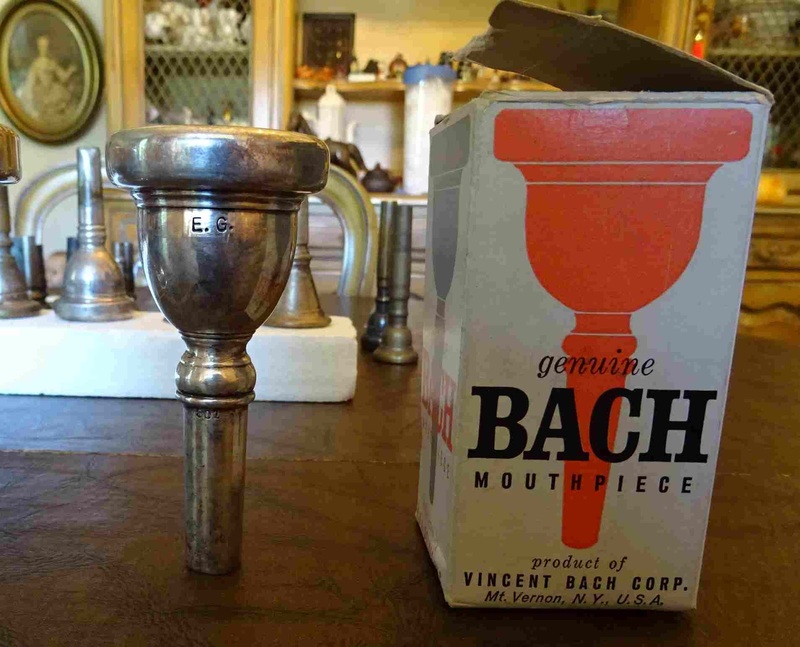 This just represents one box worth, and is hardly a treatise on mouthpieces, but I hope that some of their basic differences and qualities have been illustrated. How does one acquire so many examples? When I was in college, I used to stop in at older-looking music stores and ask if they had any old mouthpieces lying around. They usually came up with a box of miscellaneous parts and junk from the back room from which I could choose; some real treasures turned up this way. If you play a wind or brass instrument, did you have a special mouthpiece that made all the difference when playing it? What about brass instruments in general—do you have a particular favorite? Although I most often play the alto horn, my real favorite is the old-fashioned cornet, especially when played by the likes of Jules Levy, Herbert Clarke, or Bohumir Kryl on early records. You are supposed to blow horns to usher in the New Year. I hope that this post will get everyone in the mood, and that all my readers have a happy, healthy and prosperous 2018! All mouthpieces and photos of same property of the author. Photos of Pryor, Levy and the Serpent via Wikipedia. 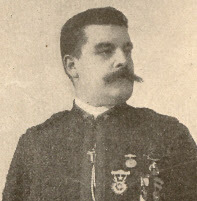 Photo of Innes located here. Well, well, well. Who knew you had a hidden interest/talent? And who knew would be in music written for brass instruments? We all have some hidden talents, I suppose - mine is ballet. Hello Hels, "Interest" is a better description than "talent." Although I started out with woodwinds, in college I fell in love with brass instruments. In my last house in Ohio, I lived far enough from my neighbors that I could indulge my brass playing to my heart's content without disturbing them! Oh my, can't believe you posted about mouthpieces... Also discovered that you too have German blood by your Grandfather Edward Gottlieb! Funny as just last week I found while filing some older family scans, a Youtube video of my Great-uncle who had been honored for his 75th anniversary with the Royal Brass Band of my home town. He was at all functions, directing it, repairing and yes, working with those old mouth pieces as well. There even was no official medal for his 75th anniversary as it was the 1st and only in the Dutch history. It made me feel proud and curious. Discussing it with my Dad on Christmas day I told him that we all inherited our musical interest from Dad's Maternal side. Definitely Dad told me and he got really animated to talk about it. 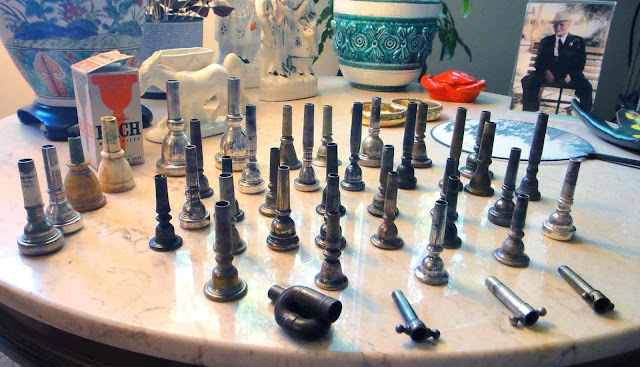 So you got quite a lovely collection spanning all sorts of mouthpieces from the era my Great-uncle used to work with. He lived to be 94 and was sharp till the very end. Pieter also played a brass instrument in the military, an S-Trumpet and briefly a Trombone. My best friend's husband, daughter and son played all in such a brass band and only the son is still active. Daughter played saxophone and her brother still does. Sending you hugs for a good ending of this year and a Happy New Year in good health! Hello Mariette, How interesting to hear of your uncle's important association with the Royal Brass Band. Europe is famous for its brass bands, and they have a different flavor in each region and use different instruments. Can you give us the link of the video? Bands are a lot of fun to play in. I played in the band at college, but instead of a brass instrument I played the contrabass clarinet, too big to march with so I played in the concert band. When I drive through Ohio many little towns have a bandstand on the town square, and some of them feature occasional band concerts. By the way, the Gottliebs were from Hungary, so I understand, and went to York, Pennsylvania in the 1800's, so I am not too sure about the German connection; it may be quite distant. Thank you for your New Year wishes and I return them to you and Pieter. Well, the name Gottlieb is guaranteed German and going back in history the borders of the German speaking countries have been shifting with several wars going on. In Hungary we both could speak often German while visiting during a congress in the mid 80s. Hello Mariette, I just listened to the serenade, and enjoyed it all the more knowing that it was your great-uncle who was being honored. Thanks for providing the extra links, because my sidebar videos apparently are not the same as yours. I also listened to the Pomp and Circumstance March played by Koninklijke Harmonie van Horst, and will go back to check out some of their other numbers. But I'm glad that you managed to hear some of the Koninklijke Harmonie of Horst! Indeed, in your region the sidebar videos appear different. It also depends on your searches and interests. But you got the name and can do a search within YouTube. Guess we all have to live with many, many questions in regard to our ancestors and it will remain a puzzle for the biggest part. I've always dreamt about going back in time e.g. 500 years and meet my ancestors. How much I would love to hear you play, my dear friend Jim. 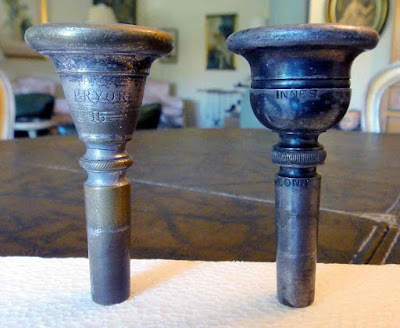 It is an outstanding post on the subject of horns and mouthpieces. Worth reading two or three times to get all the good bits. I'd hate to take a quiz on all the information you are teaching us, but love to hearing someone like you explain all the great details. I must say, you write so well. Really draws me in when reading your post. You paint perfect pictures with your words, and the photos makes the experience exceptional. As I read your post I started to hear my own favorite horn serenade in my head--made famous by Perez Prado (King of Mambo) 1955, Cherry Pink and Apple Blossom White, top of the charts for weeks and weeks. Hello Linda, Thanks for reminding me of that classic, Cherry Pink and Apple Blossom White. Thanks to Youtube, I just listened to the original version you recommend by Perez Prado, very Latin in style, and also a more lush 1960's version by Al Hirt. Mrs D: My father had a record by Perez Prado called 'Patricia'. You have brought back a far distant memory for me. I had forgotten all about it! I just found it on Spotify and now I'm hearing it for the first time in 60 years. Firstly, I wish you a very peaceful and prosperous New Year Jim. I knew nothing about mouthpieces for brass instruments - until now! Also on Spotify, I have found a crackly 1903 cornet recording of The Last Rose of Summer by Julian Levy. I just read that, as a boy, he started with just a mouthpiece because his family could not afford an instrument. Hello Jim - I too was interested in the name Gottlieb and assumed it to be German - according to wiki the name means "God's Love". Is that a photo of your grandfather in the background wearing a panama hat? I envy you your musicianship having learnt to play the piano without any great success. What a wonderful and varied collection of mouthpieces you have, and I hope that you will use one of them to usher in the New Year with just a very quick blast so as not to upset the neighbours too much. Wishing you a very Happy New Year 2018, and thank you for all of the wonderful comments that you have left for me over the years. Each and everyone of them is very much appreciated. Hello Rosemary, You have sharp eyes to spot that background photo. That actually is my great-grandfather, the tuba player's father-in-law. I miss both of them! I only have two mouthpieces in Taiwan--oddly enough the best and the worst, the Jupiter and the Victorian alto. Perhaps I'll take a tip from Bazza's comment about Jules Levy and just use blow on the mouthpiece. Happy New year to you, too. It is I who need to thank you for all your posts that have provided so much entertainment and knowledge. Dear Jim! You are a splendid mouthpiece for....well, you know. Like everything on this earth, it seems, the more you dig into it, the more interesting it becomes. In this world of mass-produced stuff, it's kind of special to know the attention to detail once given to something as seemingly simple as a mouthpiece. Well done. Happy New Year Jim! This was just fascinating because my husband plays the clarinet. He has two instruments that he's owned for 45+ years and one from high school. His favorite mouthpieces are crystal and again, several are decades old. His most frequent complaint is finding the right reeds. Although professionally trained (masters from New England Conservatory), he went to business school to make a living. In retirement, he plays in a community concert band, sits on a music school board and wrote a book about managing in the performing arts. Our cats run under the bed when he practices his clarinet, but they are Philistines. What a wonderful collection you have on your hands (lips)! 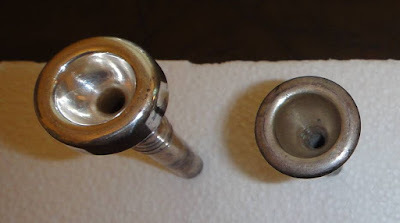 I must admit to having never seen an entire collection of these mouthpieces and at first, I thought they were hose nozzles. I do like the way the brass has hung around on the ivory mouthpieces turning them green. They almost look as though they were made of glazed earthenware. Happy New Year to you and I think you should post a clip of you playing so we can all marvel at your talents. Hello CD, It is a lot of fun buying a new mouthpiece and hoping that it will turn out to be The One. After a while, you can intuit some of their characteristics just by looking at them, but the only real test is trying them on an instrument. I know NOTHING about MUSICAL INSTRUMENTS but I enjoyed this VERY MUCH! I will KEEP MY EYES PEELED as I wonder the FLEA MARKETS!!!!!!! You have excellently made up your world with the brass instruments. Hello rtc, When my college band started playing some of the old brass solos, that piqued my interest, and soon I was collecting old cornet records and learning to play a bit with old, unused instruments that were in the band room. Hello Jim, I saw the sluiceway of the river. People piled up the stones with sweat. It speaks no words but you can hear its voice. Hence it can be said that this ruin still keeps value. This may well be my favorite of all your postings. These mouthpieces are all so sculptural that they really should be out on permanent display. I could see a narrow wall with rows of shelving about 3" deep. But something also tells me that you would need to build an addition to wherever you're living! The photograph of your great-grandfather reminded me of my own grandfather who was a wonderful flute player. Hello Mark, While these mouthpieces look good upside-down, in order to display them upright I inserted bamboo skewers in a block of Styrofoam; I could probably devise something more permanent. They are all in Cleveland (except for that alto one); Taipei's air is so corrosive that it would instantly destroy any silver that they have remaining! Do you have your grandfather's flute and did you hear him play? I wonder what make it was, and whether it was wooden or metal. Hi, thanks for popping by my blog today! Wow, you sure know your mouthpieces! That is quite the collection - wow! All these years of antiquing and buying, I've never come across a brass mouthpiece. Thanks for sharing your collection and for educating us. The ivory ones must be very rare? ?